Only a couple more weeks left and I'll be done with CDL training. Can you believe it?? I sure can't! But I'm feeling ready. Our tentative date for the Secretary of State to come test us is February 17th, so it's going to come up quick! Today started off with pre-trip as always, and I nailed it. After the poor performance on Friday, I really wanted to do well today. I studied quite a bit over the weekend and did an excellent job today. Some of my classmates didn't do real well again, but I don't think they put in the study time that I did. I've used a ton of index cards that have been converted into flash cards. I find this to be the best way to quiz myself. On one side of the card, I'll write something like "Trailer Spring Suspension" then on the back of the card I have listed everything I must know. After going through the cards over and over again, I'm starting to remember everything pretty well. It feels good to finally get a handle on the pre-trip aspect of this. I'll be honest, that portion of the class has been a bit stressful. The instructors have really hammered us on it. After the pre-trip stuff, I was with a group of four people who spent the entire rest of the morning in the yard practicing on the obstacle course. We're gettin' good! My backing skills are really coming along. I've learned one big thing when it comes to backing up on an angle. Setting up for the back is probably the most important thing in backing the truck up. If you're able to position the truck correctly, all you have to do is drive straight backwards and the trailer will do the majority of the work for you. Once the trailer is "in the hole," all that's left is to swing the tractor in front. If the truck isn't positioned properly though, it makes the entire backing more difficult. I'm not sure how well this will apply in the real world, but in the yard, proper positioning makes a world of difference. I've noticed the biggest problem people make, including myself, is overcorrecting. Smaller movements tend to be the best way to go, otherwise you end up "snaking" the trailer in. Ideally, while not always possible, you should put one hand at 12 o'clock on the steering wheel and never move it any further than 9 or 3 o'clock. This is especially true during straight backing, but if done right, is also true during the 45 degree back. Small corrections! I've also learned another trick. Since I must stop the truck at a specific point during my 45 degree back, it is imperative that I have a clear view of the left side of the trailer and can see the rear trailer wheels. This helps me reference exactly how far back I am when compared to the cones. I've found a specific point between two cones that I can line the back tandems (trailer wheels) up with and I'll be perfect every time. Problem is, I have to position myself perfectly so that the tractor is either completely straight with the trailer or slightly slanted to the left. So I'm conscious of this during my entire back and have done a real good job with it. Also, one of the things we must do is pull the truck up to a specific point and stop. If you go over the specified point, you fail. If you are too far behind the spot, you either rack up points, which is bad, or you fail. I've found that I can line the driver's side mirror up with a cone. When the mirror blocks the middle of the cone (not the top or bottom), then I stop and it is always perfect. Since the cones will be placed in the exact same spot during my exam, I'm feeling pretty confident that I can pass the "skills test" out in the yard very easily. The only other challenge is a measured right turn. 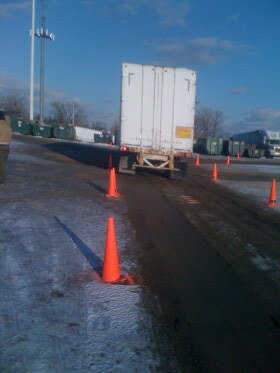 We pull forward about 20 yards (educated guess), then turn right and get the trailer as close to a cone as possible. If you hit the cone, it's an automatic fail. If you are too far away, you gain points (bad) or you fail completely depending on how far away you are. Well, I have a trick here too. When I start to pull forward for those 15 yards, I go at idle speed in first gear and start counting, one thousand and one, one thousand and two, one thousand and three....and so on, until I get to nine seconds. Then I crank the wheel all the way to the right and watch my right mirror. Once I know I'm going to come close to the cone, I start turning back to the left and correct as necessary. It sets me up perfect every single time and I'm now consistently scoring very well. We practice on the same exact course we'll be tested on and will have the same exact cone set-up. So why not learn these little tricks, right? The yard is really becoming a lot of fun for us. It's no longer something we struggle with (most of us). It's more of a fun game and a competition between us to see who can do the best. We aren't worried about failing, we just want to beat the guy who has done the best so far. Yeah, we've come a long way in a short time! There is one guy in our class who has failed the obstacle course a few times now. He's joined our class to try and get better. Today was a great day for him. He has really struggled with the 45 degree back for close to two months now. But today it just clicked for him. A light bulb went on somewhere in his head. Before today, he couldn't do the 45 degree back without taking out cones or having the instructor walk him through it. And remember, he's been doing this for close to two months! Then today after one bad run, he was able to back it in perfectly twice in a row. It's such a great thing to see somebody who has been struggling finally "get it." He was all smiles the rest of the day and I feel great for him. It's tough to watch people struggle, but great to see when they finally figure it out. Backing is one of those things that just seems to "click" for people. One day the trailer is all over the place, then the next day they are better than anyone else. So for those of you who might struggle with the backing skills, just practice as much as you possibly can and try not to get discouraged. Soon enough, you'll get it, and you'll be able to back with the best of them. The afternoon was spent out in the road trucks and I did a great job. Friday definitely was a fluke, because today I was flawless. I did grind a gear, but was able to get it back into gear right away. 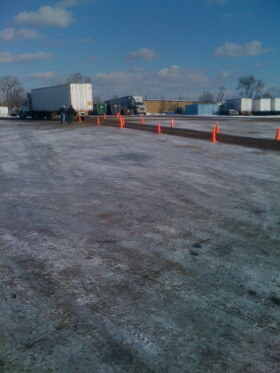 For the actual exam, we cannot have the shifter in neutral longer than the length of the truck. I didn't even come close to that, so no problem. My shifting is becoming more refined and my downshifts are still fantastic. I truly believe that if the Secretary of State came out tomorrow to test us, I'd have a decent shot at passing everything. The only way I feel I could fail is if I make a boneheaded mistake (not using or canceling a turn signal, getting out of gear and not able to recover, stalling the truck, driving the trailer on the shoulder after a turn, etc.). But there isn't much else to say about my driving. For some reason, I just seem to really have a thing for it. It's coming to me very easily. I don't mean to sound cocky, but it feels good knowing that I'm confident behind the wheel of this beast that intimidated the hell out of me just a week earlier. If I'm ready now, in two weeks when we finally take our exams, I should be golden! Then, when I finally go on the road with a company trainer, I'll have to re-learn everything the "real world" way! Do you really think truck drivers double-clutch all day long? I don't think so! Not much else happening right now. I'm still applying for different companies just to get as many pre-hires as I can. I'm continuing to pester my recruiters so they don't forget about me. I want them to have my name memorized by the time I start! My preliminary orientation date with my top choice company is March 2nd, so it's less than a month away now! The recruiter told me that date will probably change, so I won't get too excited about March 2nd, but my time is nearing. Thanks everyone for all your support. I hope my experiences are interesting to you and are helping those of you who are about to enter training. If you have any questions, please don't hesitate to comment or email me.